The repaired wall before the road was reopened a few days ago. Mere days after it reopened after a three month closure, the road linking Digby Bridge to Osberstown has been closed again until futher notice. 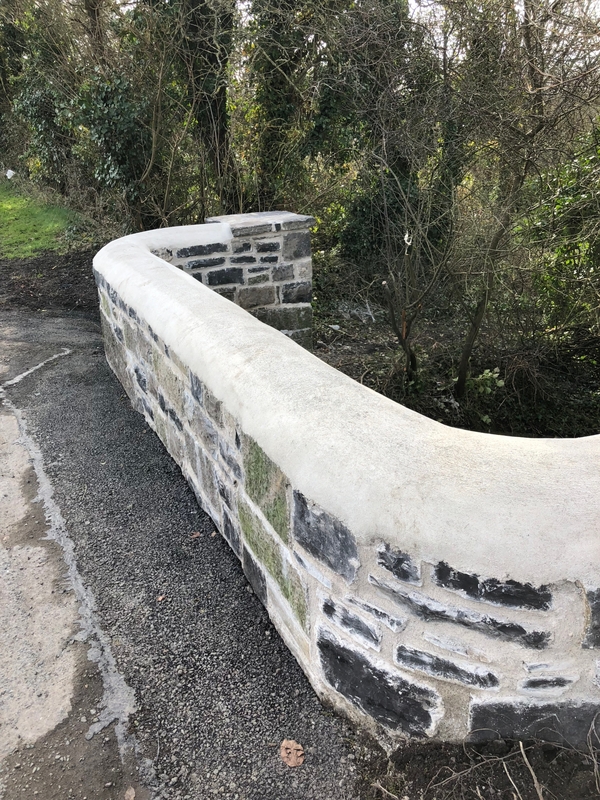 Last January a section of wall on a bridge adjacent to the Leinster Aqueduct fell away into a ravine making the road unsafe. The road was closed for several months for repair until it reopened a little more than a week ago. However, in recent days the repair wall was struck by a vehicle. Kildare County Council informed Waterways Ireland, which is esponsible for the structure, and the road was reclosed again. A statement from the County Council gave no indication of how long it would be closed on this occasion, except that it would be “until further notice”. As well as repairing the wall of the bridge, a 3.5 tonne limit was placed on the road, and warning signs were placed on the approach to the narrow section of road that goes over the Aqueduct. The Aqueduct, carrying the Grand Canal over the River Liffey was constructed in 1784 as part of works to extend the canal out as far Robertstown.